During the Winter season, some dogs might experience joint pains and aches causing them to move slower than usual. It was a common complaint from many of the Veterinary Hospital clients I saw. My dog doesn't care for the cold weather herself and some of that could be due to the effect it has on her joints. Shiner is a senior dog at 11 years old. 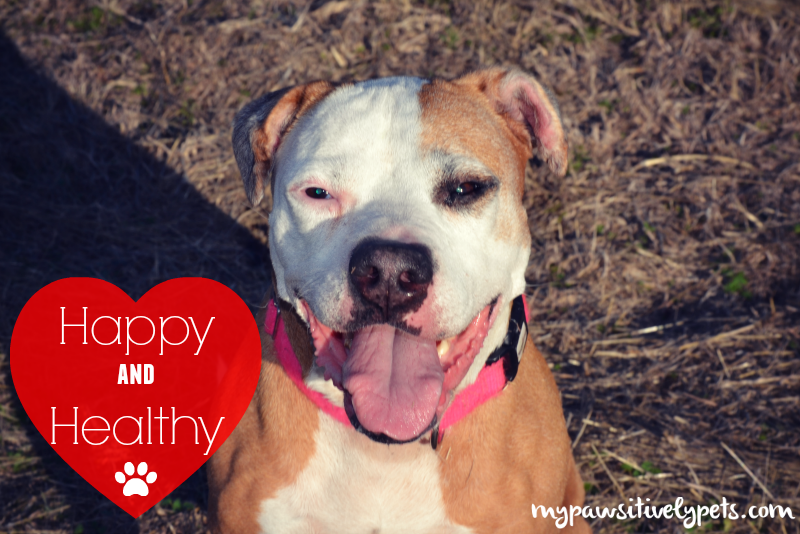 I am lucky that she has stayed happy and healthy for the most part throughout her life. But I still want to keep her happy, healthy, and comfortable for the remainder of her life. Helping her joint mobility stay strong is important so she can continue to play, run, and have fun like she's a young dog. That's where Rejenease Joint Supplement for dogs comes in. About a month ago, Shiner started taking this joint supplement for dogs. It's a liquid supplement that I add to her food twice a day. She has no issues taking Rejenease in her food. 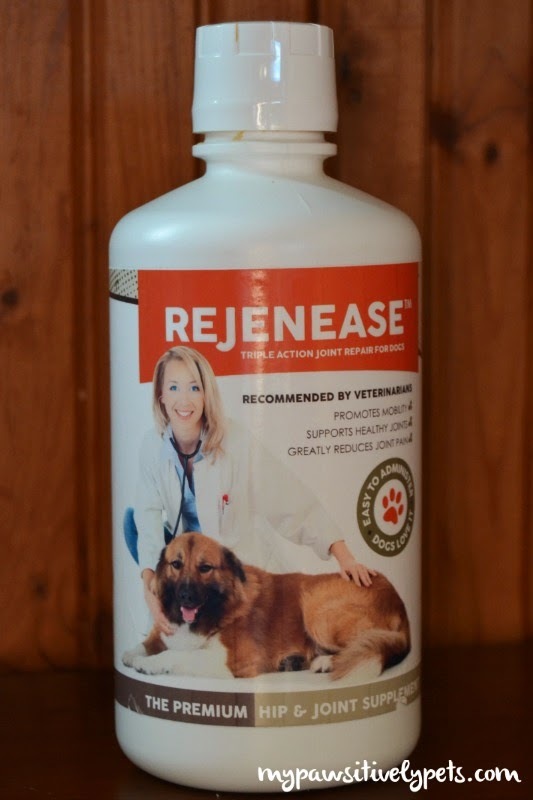 Rejenease joint supplement for dogs contains the active ingredients Glucosamine HCl (Shellfish), Chondroitin Sulfate (Beef and/or porcine), MSM (Methyl-sulfonylmethane 99.9%), Manganese Chelate, Hyaluronic Adic (as Sodium Hyaluronate). This dog joint supplement does NOT contain any sugar, starch, salt, wheat, gluten, yeast, corn, milk, or soy derivatives. According to the Rejenease website, dogs who have barely been able to move "roll back the years" after taking Rejenease joint supplement for dogs. Shiner occasionally gets stiff joints, particularly in the Winter. During her month long trial of taking Rejenease, she has not experienced any joint pain or stiffness that I can visibly identify. She also seems slightly more energized and ready to run around and play. Here's a few pictures of her showing off her excellent senior dog joint mobility after taking Rejenease for a little over a month. 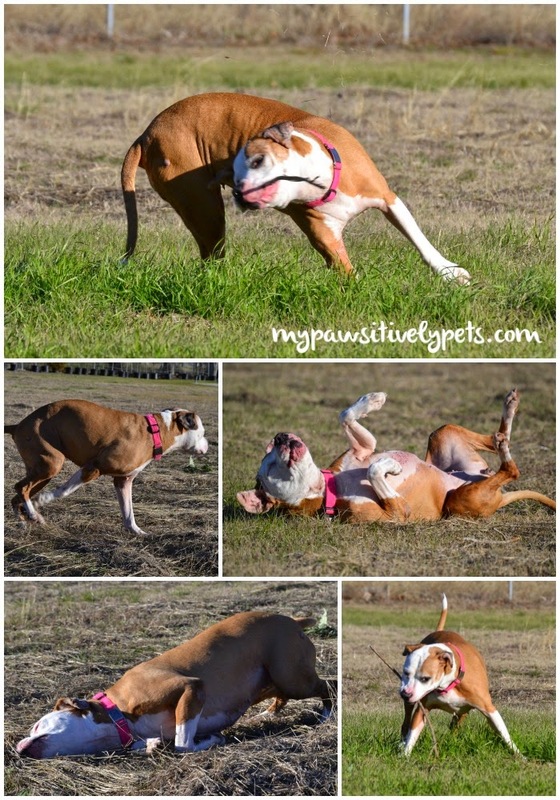 She's still got the moves and seems just as limber as she was when she was a young pup! Senior dogs are of course not the only ones who can benefit from taking a joint mobility supplement. Young dogs and dogs with orthopedic issues can also see good results with a joint supplement. If you would like to try Rejenease with your dog, they are offering our readers a very generous discount. To save 25% on your first bottle of Rejenease, use the special code PAWS2015 at checkout on Amazon. Click here to purchase. If you're already an Amazon Prime member, you'll automatically get free shipping. If not, you should select the "FREE Shipping" option so that you won't have to pay shipping charges. On the final order page, there is an option to input Gift Cards & Promotional Codes. 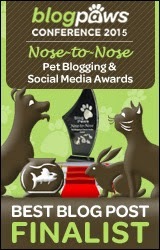 This is where you should enter the code PAWS2015 for your 25% OFF discount. This discount is valid through the entire year of 2015 and expires on 12/31/2015. It is only good on your first bottle of Rejenease. 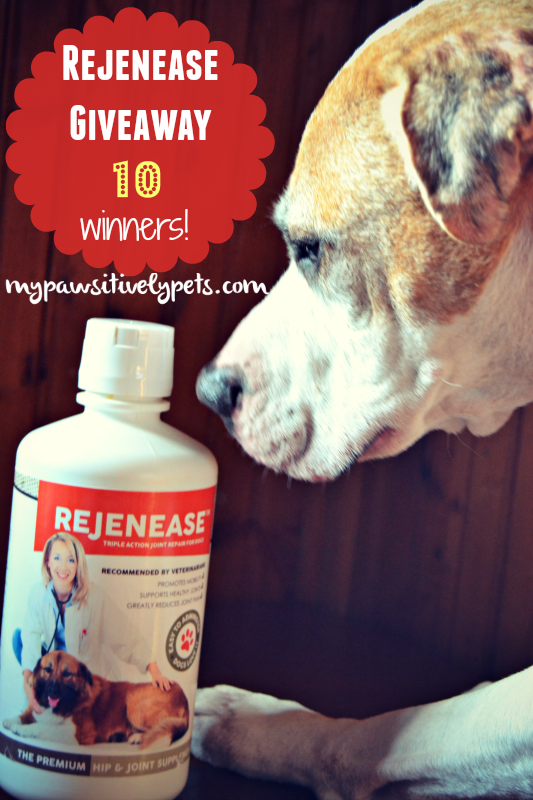 And how about a chance to WIN a free bottle off Rejenease Joint Supplement with your dog? 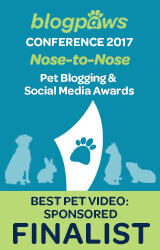 We've teamed up with Rejenease to give away one bottle of Rejenease to TEN different Pawsitively Pets readers. This giveaway is open to US residents only, ages 18 and up. One winner per household. To enter the giveaway, simply fill out the Giveaway Tools widget below. Remember that all of the entry methods are optional and you only need to do one of them to be entered in the giveaway. This giveaway will end on January 16th at midnight Central Time. Good luck! This post is sponsored by Rejenease. 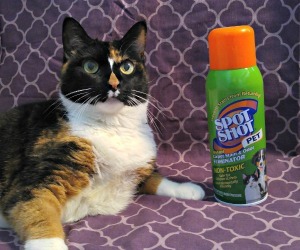 Pawsitively Pets was compensated for our time reviewing this product, but all opinions are our own and we only share information we feel is relevant to our readers. This post does contain affiliate links. I have a 14 year old bc mix and she has definately slowed down. She has arthritis and Anything to help her with easier movement would be great. I did not realize that Shiner is that old. I would have never guessed. Shiner looks like a puppy not a senior dog. Its amazing how well you take care of her, I have kept my dog on glucosamine supplements since she was a puppy since she is a large breed dog who will definitely have issues as she gets older. Shiner gets that reaction a lot! I agree, Shiner is so pretty and looks so young. It's great when there are products like that to help out. We rescue older dogs - the hardest to adopt out from rescue. All of my dogs could use some mobility improvement. Those stiff joints need some help! This product looks awesome Ann and I love the amount of Glucosomine in it. Titan has been taking Dasuquin but since winter crept around, I've been giving him almost double dose. Dang cold takes a toll on both of us. I just orders my bottle and look forward to checking it out! Thanks for sharing and the discount! Good luck Bren! I guess I hadn't heard about Titan's hips in a while. Hope he is doing OK. I know you have battled with it in the past. I'm hearing great things about this product, and might be working with them myself. We have everyone on joint supplements around here and I'm trying to figure out what the best one is for everyone and their individual needs! Good! I recommended your blog to Mr. Steven! Jeffie is almost 9 years old and currently has a cruciate ligament tear and some arthritis problems. I'd like to give this a try and see how it impacts him. I just adopted a senior dog (we aren't sure how old he is but his face is grizzled); he seems a bit stiff when he walks and this might help him. Interesting, sounds like great stuff! Told my sister about this - her dog is 9 years old and she said he suffers from joint pain. Thanks! Puppy's health is top priority. I've been debating whether or not I should start him on joint supplements. I think it would increase his energy level and give him more stamina. Since my dogs do agility, I'm trying to do everything I can for their joints now so they don't have problems later. Trying to get caught up while I was tending to my Mom, sorry I missed this contest. Harley is 6 yrs old now, and even though he's not showing any signs of joint pain, I am trying to learn as much as I can. This was a great review, and I will look into their website for more info. Take care - how are you doing?